Today I’m sharing a new view of our home! This is the front of our foyer, and I finished up a couple of little things so it could be dressed up for the Christmas season. This is a sponsored post in partnership with Balsam Hill. However, all opinions on their products are my own. Please see my disclosures here for more information. 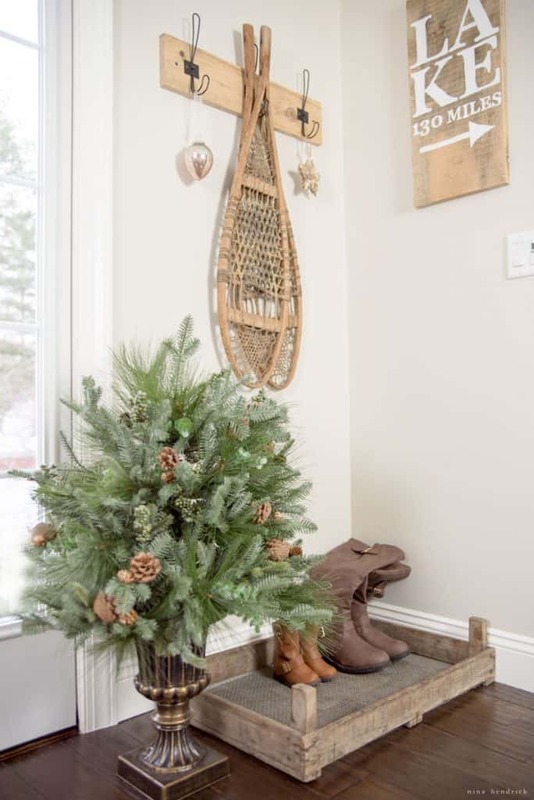 While our mudroom is the place where we enter the house from the garage, the foyer is the first view of the inside of our home when guests arrive. I’ve been focused on making it a blank slate after removing two small, cluttered closets flanking the door. Now that the blank slate is accomplished, I’m focusing on warming it up and making it more welcoming for guests. These warm and woodsy pieces from Balsam Hill are the perfect touch and match closely with the rest of our Christmas decor. 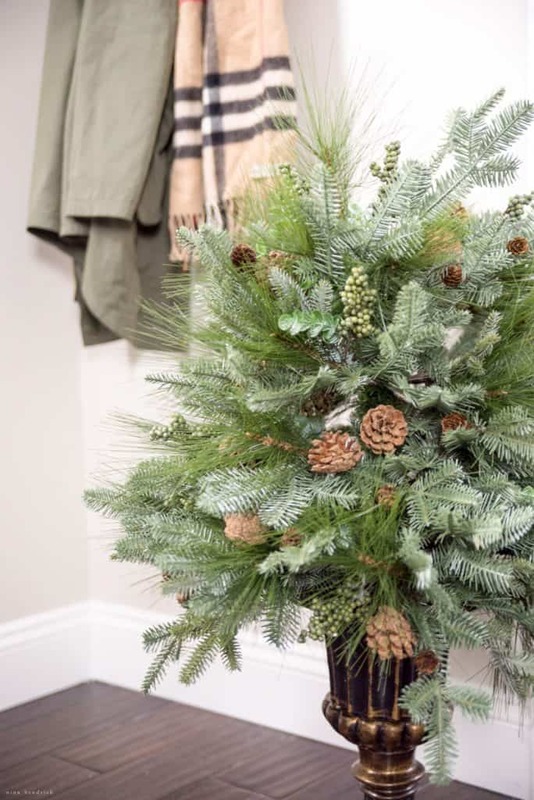 The Wintry Woodlands Potted Foliage is a combination of all of the greens and natural elements carried through my home this Christmas. It evokes the feeling of the walk through a snowy wood that has been my theme for the entire season. 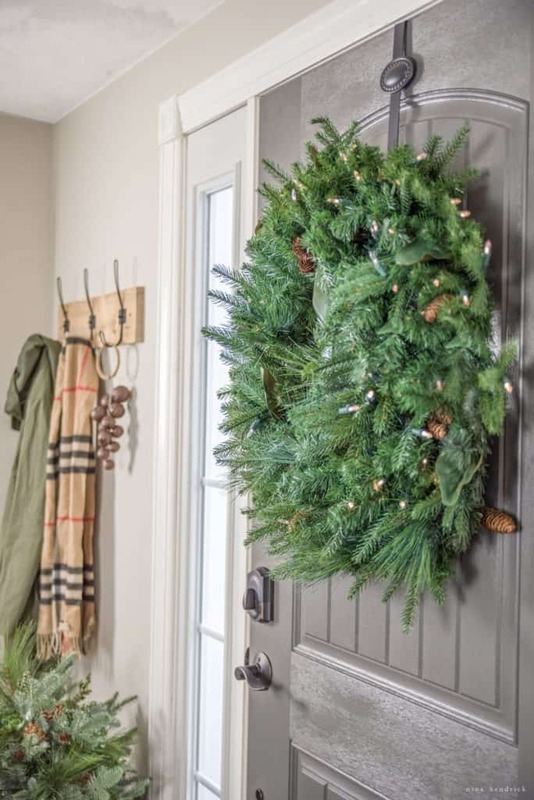 I also can’t say enough about this Evergreen Magnolia Wreath. 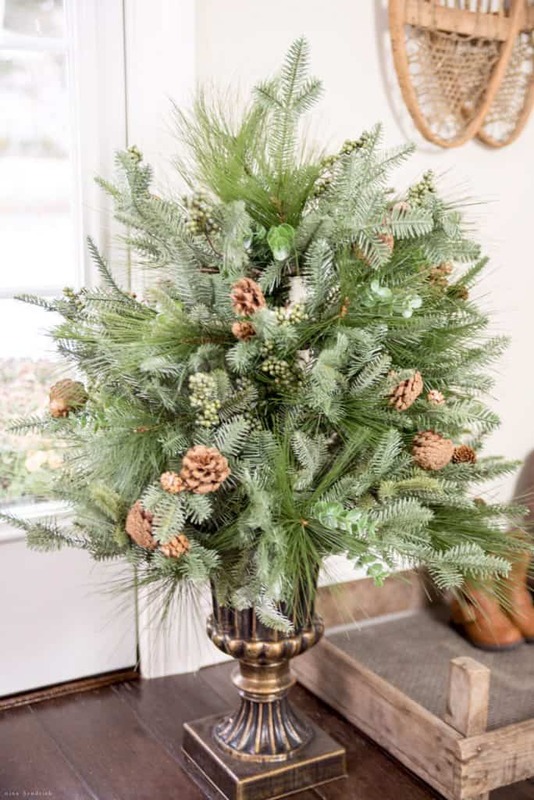 It’s beautifully realistic, and I love the rustic feel of the combination of magnolia leaves and pine cones. Also, on a more practical level, it’s so nice to have a pre-lit battery-operated wreath on a timer. I hope you enjoyed this little glimpse into a new space! I will be back tomorrow with the rest of my Christmas decor! They are also giving away twelve $150 Balsam Hill Gift Cards- wouldn’t that be fun to win? Love your decorated foyer! 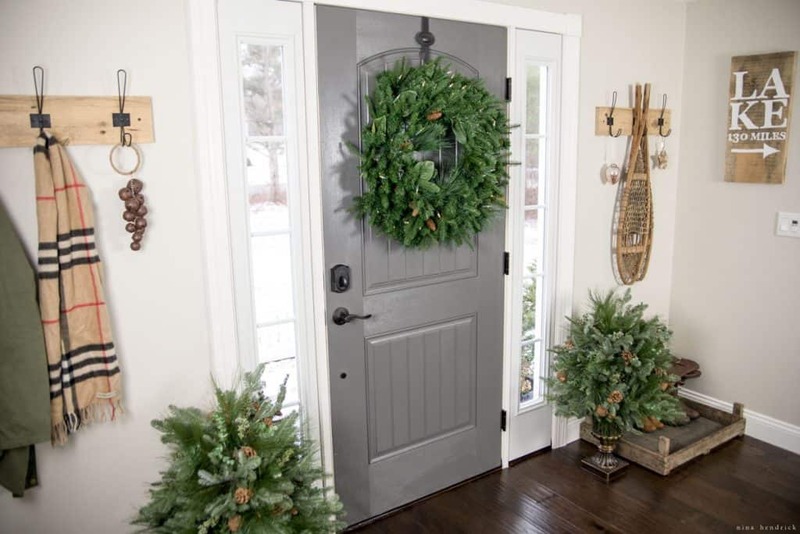 Can you tell me what gray paint color you used on your interior front door? It looks like a true gray with no blue, brown or green undertones. 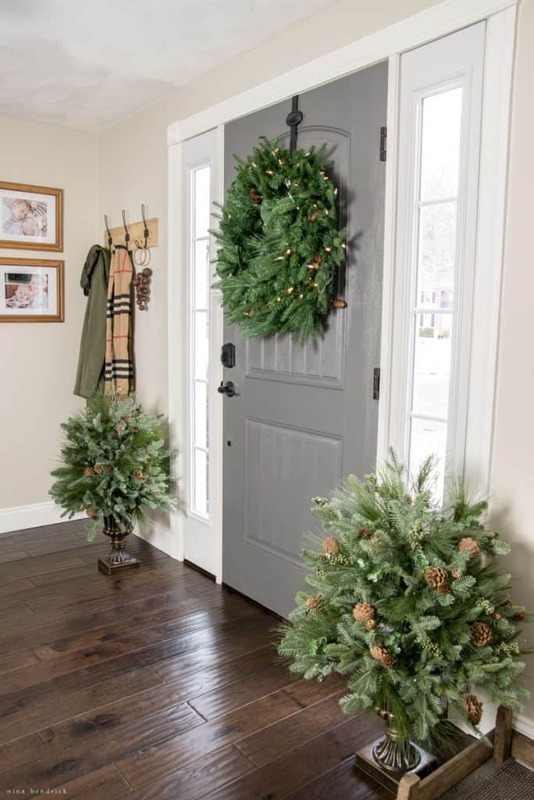 I’m having difficulty deciding on a gray color for my exterior front door and shutters due to the undertones in some gray colors, but yours looks like a “true” gray. I love your posts! Just curious, what color did you use on the walls of your foyer? I love the color!